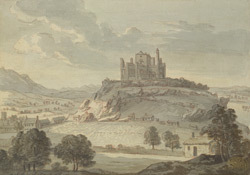 View of Cashel Rock- a fortified outcrop of limestone rock, in County Tipperary, Ireland. Also known by its Gaelic name Caiseal Mumhan, this is one of the most spectacular archaeological sites in Ireland- great stone walls encircle a group of Medieval buildings. The Rock was first fortified as early as 300AD by the Kings of Munster who built ecclesiastical and residential buildings here. Later in 1101 King Muircheartach O’Brian built a chapel and a round tower. The Rock was then given to the church and a large cathedral was added in the mid 13th century. In the 14th century Archbishop O’Hedigan built a fortified tower house here.